Phase pure NaR5(MoO4)8 (R = La, Pr, Nd, Sm) ceramics were prepared by a conventional solid-state ceramic route at low sintering temperatures. Powder x-ray diffraction studies were performed to confirm the phase purity of the samples. The presence of MoO 4 2- tetrahedra in the crystal structure was confirmed by Raman spectroscopy of the samples. Surface morphology investigations using scanning electron microscopy show that the sintered samples have compact microstructure and phase homogeneity. The microwave dielectric characterization of the sintered ceramics show that the samples have excellent quality factor, low temperature coefficient of resonant frequency and hence are ideal candidate materials for microwave circuit applications. 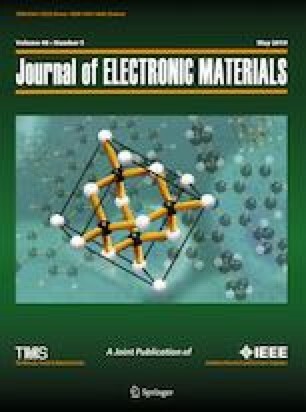 The NaR5(MoO4)8 (R = La, Pr, Nd, Sm) ceramics possess εr from 10.6 to 11.5, quality factor Qu × f from 56200 GHz to 78600 GHz, temperature coefficient of resonant frequency τf from − 42 ppm/oC to − 72 ppm/oC and linear thermal expansion coefficient CTE ranging from + 8.75 ppm/°C to + 11.54 ppm/°C. The chemical compatibility of the ceramics with silver electrodes was determined by x-ray diffraction and energy dispersive x-ray spectroscopic analyses of the silver co-fired ceramic samples. The authors are grateful to Dr. N. Raghu, Director, C-MET, Thrissur for extending facilities to the work. The authors are also thankful to the Board of Research in Nuclear Sciences, Mumbai, for financial support under Grant Number 34/15/01/2014-BRNS/0906. One of the authors, Dhanya Johnson, is grateful to the University of Calicut, India. One of the authors, E. K. Suresh is grateful to the Council of Scientific and Industrial Research (CSIR), India, for the award of Senior Research Fellowship.